You do not want to miss your fitness program during your stay, but want to start your day actively? Our fitness room with modern equipment offers high-quality cardio and weight machines to choose from for your individual training. Your are also invited to participate in our weekly changing guest-active program. 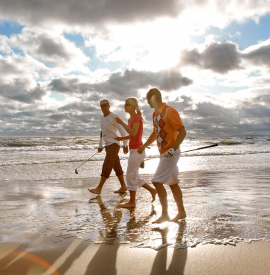 Whether it is nordic walking at the beach, aqua gymnastics in the pool or relaxing therapies - the guided activities in our BALTIC SPA and in the nature will make your body feel weel and find its inner balance.